One of your colleagues tells you he is going to climb Mt Kilimanjaro (5,895 metres) next month. Q1. Who is at risk for acute mountain sickness? Acute mountain sickness reflects lack of acclimatisation. Susceptibility to the condition is not related to physical fitness. Acute mountain sickness (AMS) is rare below altitudes of 2500m. nausea and/or vomiting, fatigue, lassitude, dizziness, and difficulty sleeping. Recent altitude exposure can be protective. There is no simple way to identify who will suffer from AMS prior to arriving at altitude. Those over 50 years of age may be less prone to AMS than younger people. Q2. What life-threatening conditions are associated with high altitude? Potentially fatal condition and represents the severe end of the AMS spectrum. It usually occurs over 3000m, with an estimated prevalence between 0.5% – 1.5% at altitudes between 4000-5000m. Symptoms include severe headache, confusion, ataxia, drowsiness, stupor and coma. Ataxia is the most sensitive sign, and should be considered an indication for descent. is the leading cause of death related to high altitude. HAPE usually occurs within the first 2-4 days of ascent to high altitudes. It is characterised by decreased exercise capacity, dry cough, cyanosis, dyspnoea at rest and pink, frothy sputum. HAPE and HACE can occur together. Q3. What is the pathophysiology of high altitude illness? The cause of AMS and HACEis not entirely understood. A vasogenic mechanism is thought to be responsible for the cerebral oedema. Hypoxia-induced cerebral vasodilation and alteration of the permeability of cerebral capillaries are likely causes. Cytotoxic oedema may also play a role, with failure of the Na+-K+ ATPase due to oxygen radicals. 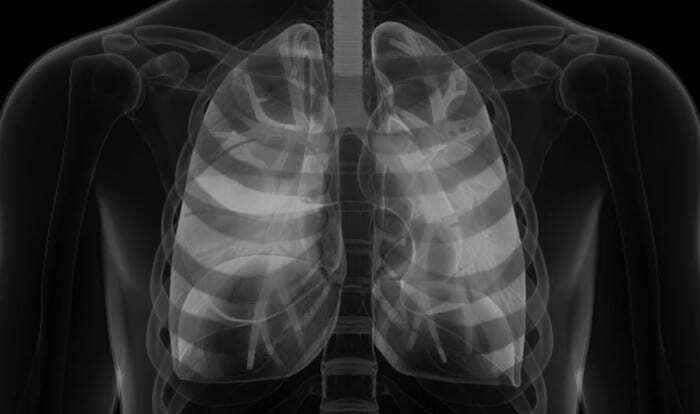 HAPEis caused by heterogenous hypoxia-induced pulmonary vasoconstriction. HAPE prone individuals exhibit greater rises in their pulmonary artery pressure at altitude. The heterogeneity of the the response causes diversion of flow to the less constricted areas with subsequent capillary leakage. Diminished reabsorption of alveolar fluid is also likely to be important, with hypoxia inhibiting Na+ transport across the alveolar membrane. Q4. Can these conditions be prevented? Slow ascent is the best prevention. ‘Sleep low, climb high’ — ideally, sleep at less than 2500m altitude on the first night, and sleep at a lower altitude than the altitude reached during the day. Acetazolamide is the most effective prophylaxis. It is a carbonic anhydrase inhibitor that causes a bicarbonate diuresis and metabolic acidosis. It increases the hypoxic ventilatory response, decreases CSF production and may also have effects on the perripheral chemoreceptors. It is usually well tolerated. Side effects include paraesthesia and metallic taste. Dexamethasone has been shown to be effective in the prevention of AMS, although it is usually reserved for short exposures (<4 days) to altitude due to its side effects. Ginkgo biloba has shown conflicting results, although recent studies suggest it is no better than placebo. Acetazolamide showed be used in those of moderate risk of AMS — individuals who have had AMS before or need to ascend more rapidly than the suggested safe rate. Dexamethasone may be used in those intolerant of acetazolamide. Both drugs may be used in high risk individuals (e.g. previous HAPE or HACE, very rapid and high ascents). drug prophylaxis should be continued until descent or until 3 days have been spent at peak altitude. Consult Luks et al (2010) to assess an individual’s risk of developing AMS, HACE and HAPE. 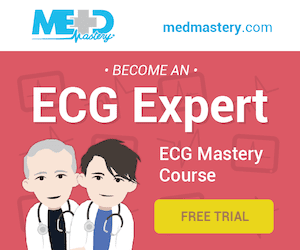 Pulmonary artery pressure can be reduced by nifedipine or the phosphodiesterase inhibitors sildenafil and tadalafil. Both have been shown to decrease the incidence of HAPE when taken as prophylaxis. Salmeterol decreases the risk of HAPE by increasing alveolar fluid clearance through its action on Na+ transport. Early recognition of AMS, so that ascent is stopped, may prevent the development of HAPE and HACE. Q5. What is the treatment? The best treatment for AMS, HACE and HAPE is descent. Mild AMS can be treated with stopping ascent for 24 hours, acetazolamide and simple analgesia. Once symptoms resolve ascent may continue, but at the risk of recurrence. 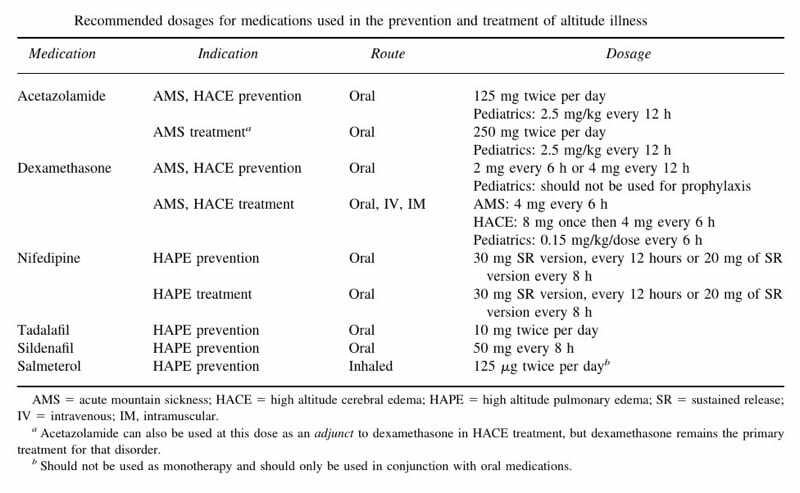 Severe AMS or HACE should be treated with descent, supplemental oxygen, portable hyperbaric chamber if available, acetazolamide and dexamethasone. HAPE should be treated with, again, descent, supplemental oxygen and portable hyperbaric chamber. Nifedipine is the drug of choice — sildenafil/tadalafil may be used if nifedipine is unavailable, but concurrent use vasodilators is not recommended. Use CPAP as an adjunct if available. There is no established role for acetazolamide, beta-agonists, or diuretics in the treatment of HAPE. Q6. What are the important management issues to consider in a patient who has both HAPE and HACE? altered mental state in a patient with HAPE may be due to hypoxia. Commence treatement for HACE with dexamethasone if the patietn’s neurological status doesn’t promptly improve with the administration of supplemental oxygen. treatment of HAPE with nifedipine will decrease the patients mean artial pressure. This will decrease cerebral perfusion pressure and may lead to cerebral ischemia in the patient with HACE. Tread carefully! Q7. What drug dosages should be used in the prevention and treatment of HAI? Q8. What is the significance of high altitude retinal hemorrhages? High altitude retinal hemorrhages are more common at altitudes above 5000m. They are usually asymptomatic and typically resolve over a few weeks. They may be found in HAPE and HACE, as well as the otherwise well person. Central scotomata can occur if the macula is involved. To see what retinal hemorrhages look like, check out NEJM Clinical Images: Retinal Hemorrhages Associated with High Altitude.